For a long time I was afraid to be vulnerable—I didn't want others to see my weaknesses. If they saw me for who I truly was, they'd surely despise me. But one day, a group of church leaders held an open discussion on sexual abuse. A recently retired professor from a seminary talked about sexual abuse and defined it exclusively as males penetrating females. Penetration was his primary word, which he used several times. When someone asked him about males being molested, he refused to admit that possibility. Finally, one man stood and said, "Sir, maybe men can't be molested, but boys can. And they are molested! And your ignorance and closed-mindedness only perpetuates the myth." Spontaneous clapping broke out before the man added, "I was six years old when I was molested—by my aunt—so don't tell me males can't be abused, and I refuse to submit to your macho BS." More applause broke out. The old professor stared stonily ahead and didn't say another word. That courageous man who spoke up did so much for me. I had only been dealing with my abuse a short time before that meeting. It must have taken great courage for him to speak up, especially to refute an authority figure. He isn't weak, I thought. He's strong. It takes deep, inner strength to do what he did. Over the next few days, I pondered that event and realized something: It takes the greatest amount of bravery to be transparent. It took a man of immeasurable strength to stand defenseless in front of others and expose himself. From that time on, I wanted to be like that strong man. Over the years, many other men said, "You're my best friend," and they sincerely meant it. But none of them was my best friend. That's not to blame them, but to admit I didn't know how to open up and trust another man. Several men included me in their inner circle; I wish I could have included them in mine. I wanted to open up, but I couldn't. My trust had been stolen as a child, and for me to expose my inner feelings was to suffer the abuse again. It seemed safer to lock up my past. I had my inner circle—which consisted only of myself. For a long time, I couldn't even open up to my wife, and yet she was the most loving and trusting soul I knew. My first break came through a friend named Martin. He told me that at age 15, his drunken mother had seduced him. After he told me, I marveled that he trusted me with that deep, deep secret. Years later, he told me that I was the first person he'd told, and that it was the beginning of his healing. 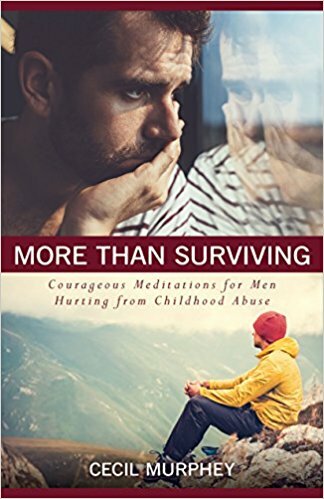 Another man, Steven, assaulted by a teacher, cried as he talked of his trauma 40 years after the fact, but I sensed he experienced some healing just from the act of sharing. Martin and Steven included me in their inner circle, even if they didn't use those words. They also opened the door for me by modeling trusting behavior. 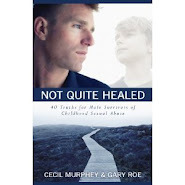 When I haltingly told my wife about my childhood assault, I expected rejection and revulsion. Instead, Shirley said, "I'm sorry," and hugged me. That same day, I told David, who later became my best friend. Just by the way he listened, I knew he accepted my pain. He didn't try to fix me; he simple accepted me. Shirley and David were the first members of my inner circle and because of them, I could invite others into it. As I openly spoke of my pain, I was giving others permission to face their past and open up. Long ago I read the statement that we abused men have holes in our life buckets. Nice imagery. The obvious meaning is that we can never live a full life until we do something about getting rid of those holes. Many keep trying to fill the bucket, unaware of the leaks from the bottom, and they don't understand why they aren't healed. For instance, years ago I was a member of a group of six men that met every week. The first week, John stated he felt like a bag of manure. Four years later, John was still talking that way. 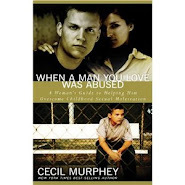 He had been in therapy for more than a decade but hadn't gotten better. To use the bucket image, he was filling the bucket with good things, but he wasn't doing any work to seal the holes. Repairing the bucket is hard work, and we may have to try to seal it several times before we figure out how to do it effectively and to make it last. In my case, turning to God gave me the courage to repair the holes. I needed to realize that I couldn't do the repair work myself, but only through divine intervention help. God may not be the repair kit for everyone, but he was for me. And he has been for countless others. What are you doing to fill the holes? Discouragement is a constant companion some days. I can relate to the posting above a lot. Some days it doesn't take much to send me spiraling into a what's-the-use frame of mind. There is so much that has gone wrong in my life. So much that I've contributed to out of anger, ignorance, or discouragement. But there is much that I have to be grateful for too, and why this seems to get lost in my sadness is hard to explain. I have a good job, make good money, am married to a wonderful wife, and my kids are doing okay too. My health is good, could be better, but I am not on disability or anything so there are a lot of people who would happily trade places with me I know. Recognizing the telltale signs of discouragement's attempt to dislodge my attitude of thankfulness and learning what to do to derail that little train of thought is what a lot of my recovery has been about. I just wish I had gotten into recovery decades ago. Who knows where I could have been today. But that is another train. D.H. Lawrence once wrote “I never saw a wild thing sorry for itself. A small bird will drop frozen dead from a bough without ever having felt sorry for itself.” (Complete Poems of D. H. Lawrence). I wish he could say the same for me. Of all the issues raised by my lifelong recovery from childhood sexual abuse, self-pity is one of the most pernicious and destructive. Would to God that it would drop from the bough, but it doesn’t. The best that I can do with self-pity is to manage it like an addiction. Addictions have a mind of their own, a life of their own, and exercise control over me by promising relief from existential, mental, or emotional distress. Unfortunately, addictions never deliver what they promise. They can’t. The details may differ addiction to addiction, but the results are always disastrous and lead me to a mouthful of corn husks with a pig pen for a penthouse. They just never pay off. And that’s where managing them comes in, especially in recognizing that feeling sorry for myself is a slippery slope into addictive behaviors. I’m so predictable. If you’ve never attended a Twelve Step meeting, it’s difficult to describe the inherent power of Step One—admitting that you and I are powerless over whatever is controlling us. A billion words or more have been written about this first step, yet few ever come easily to them. We mostly come crawling to them after waking up in the dregs, bruised, bleeding, and drenched in the sledge of whatever’s gotten hold of us, whatever we’ve given ourselves over to for the umpteenth time, be that heroin or hatred. To finally admit that something has control of us is just the admission that God, our Higher Power, is waiting to hear. Once we can bring ourselves to admit that we aren’t the center of the universe and admit that we’ve surrendered all of our self-control over to a substance, a feeling, a destructive behavior, or to another human being, healing and freedom can break in. For me, admitting that self-pity is not only unattractive but overwhelmingly destructive and controlling is a great first step to freedom from it and from all the awful things that come with it. No matter how far I’ve come in my recovery, discouragement seems to be a ready option. As a codependent, addict, and all-around needy person, I seem to have a knack for obsessing over what’s wrong in my life rather than appreciating the long list of good things I have. Experiencing even a small setback can become handy fodder for the recovery blues and send me into a long spiral of discouragement, especially if I don’t watch out for it. When I get discouraged all kinds of things start happening inside me, like paranoia, sadness, isolation, and a lot of fear. I start shutting down to my present life and feel like I’m “walking beside myself,” something author Leanne Payne calls morbid introspection. I call it hell. It’s like second-guessing every word you speak and finding fault with every nuance of yourself, your looks, your talent, your intellect. Even the way you laugh or the way you walk—everything you do seems wrong and unacceptable somehow. You’ve probably noticed this in others, those people who are miserable inside and out all the time. It’s easy to see it in them, but it can be difficult to diagnose in yourself and even harder to cure. What I’m learning is that discouragement can start with small things and then escalate into something far too big to handle. For instance, someone makes a thoughtless comment and I take it too deeply, reading meaning into it they never intended. A project goes south and I begin to think there’s no way to get it back on track. I receive a bit of criticism, deserved or not, and suddenly I believe I’m a completely worthless person, unworthy even of the air I’m breathing. That is a very, very unfortunate way to live. Allowing myself to dabble in discouragement is dangerous for me. It’s like letting a child play with a poisonous snake or a loaded gun. It might seem okay for a moment, but the potential results are deadly. Today I choose to lay discouragement down and be thankful for the good things I have and the good things I know are yet to come in my life. I've discovered about my recovering self that I must resist. Panic is my enemy, not my friend. The bizarre tendency I have to turn minor upsets into major catastrophes must be tamed.